JACKSONVILLE, Fla. (Sept. 8, 2014) – Nearly eight years ago Alecia Calloway was given a neatly folded American Flag at a military funeral. Her husband, 23-year-old Cpl. Isaiah Calloway had died after being wounded in a firefight while serving with the U.S. Army in Afghanistan. During the 2006 funeral service in Jacksonville, Alecia wore a set of metal “dog tags” around her neck to remember her husband’s commitment to the Army. Soon, Alecia will be wearing her own set of ID tags as she joins the Florida Army National Guard. 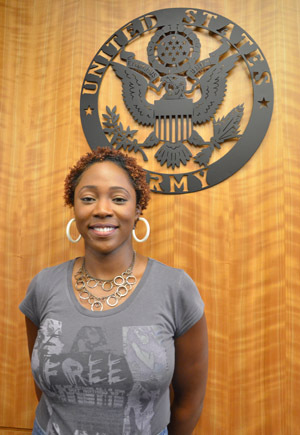 On Aug. 27 Calloway took the Oath of Enlistment at the Military Entrance Processing Station (MEPS) in Jacksonville, joining the Florida Army National Guard’s 2153rd Finance Detachment. Once she graduates from basic training at Ft. Jackson, S.C., and completes advanced training, “Pvt.” Calloway will serve as a Financial Management technician in St. Augustine. Calloway said some people were initially shocked by her decision to join the Army National Guard since her husband had died while serving and she is raising four children. According to Calloway, her three girls and one boy – ages 6-12 – were very concerned about the decision to join. “In the beginning they weren’t happy about it because they thought I would be doing the same job their daddy did,” Calloway said. Eventually the children warmed up to the idea and gave her their blessings, as “’long as Mommy doesn’t get into harm’s way,’” she explained. Although to date, Calloway is just one of the 1,350 Soldiers who have enlisted in the Florida Army National Guard this fiscal year, her willingness to join is an inspiration to Florida Army Guard recruiting force. Calloway said her biggest concern about joining will be missing her children during the initial training, since the longest she has been away from them was 2-3 weeks. But in the end, she said she believes the sacrifice will be worth it so she can serve her state and nation in uniform.